The USAF had decided to discontinue the primary trainer and put student pilots directly into advanced trainers but, after mulling it over, changed their military minds. After an $8-million contract was awarded to Fairchild in 1949 for the Navy's XNQ-1, they again changed their minds, canceled the contract, and held more evaluation trials with various aircraft. 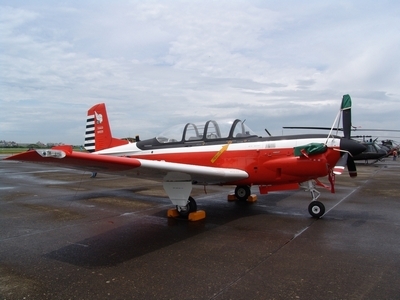 From these the Beech Model 45 was accepted in 1953 as the tandem cockpit and straight-tail T-34 Mentor for a production run of more than 1,200 units. USN evaluation took place in July 1953, after which orders were placed for 423 planes as T-34A and -T-34B. Production ended in 1957.